The sun is shining and fortunately the frost isn’t that deep at Lakemoor. 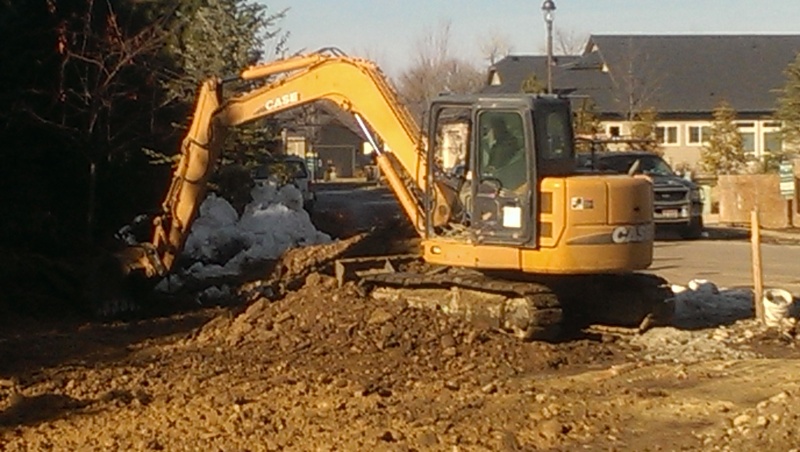 It’s always a great day when you break ground on a new project. It’s even a better day when you break ground in the middle of January in Eagle, ID and there is no snow and you have the great fortune to eat lunch on the patio at Zen Bento in beautiful downtown Eagle. Steve with SC Construction is digging the clearance in the photo to the right. We have always enjoyed working with Steve and his company. They are building a dream home with a Timber Frame. To top it off, they are always on time, fair in their pricing, and we never have to give a second thought to the quality of their work. Our homeowner is on vacation this week on this project so they are missing the big day, but we have uploaded a great deal of photos to their personal webpage that we provide all of our homeowners at Bspoke Homes. Please keep an eye on the progress of this 2265 square foot single level one off home!